Apple iPhone XS Max Features: The iPhone XS Max which the company calls Ten S Max is a unique smartphone from Apple. You have never seen this designing concept in the entire iPhone range. It is the grand smartphone from Apple which is never seen before. If you are iPhone fan, then this amazing model will blow your mind away. With the screen size of just 5.8 inches, the company jumped in a 6.5-inch concept which has taken over the likes of all other iPhones. The iPhone XS Max also comes with a top-notch which is now extremely hit. It is great for peoples with big palm who love to experience new iPhones. 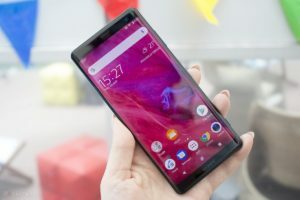 With an on-demand big size, the smartphone is also offered in a big price tag which can divert your mind from purchasing it, only if you have a tight budget. However, it is completely worth its features, specs and the wonderful design. It will give a tough competition to the high-end smartphones available in the market. The company has launched the iPhone XS and top-specs XS Max together, but the top-specs variant is more compelling. The company has also improved the battery and performance in this model. These features will be carried forward in the future iPhones. Till now, iPhone X was the best-selling smartphones of this year, but it seems that we will soon see the XS Max in the top best list of phones in the upcoming year. The phone has got a great response from the users since its launch. It has attracted many young-gen customers who always prefer new models with unique features. In this article, you will find the full features and specs of iPhone XS Max. Gadget Features have reviewed many smartphones and found that this new-gen phone is outstanding in terms of design and performance. So, let’s begin. The iPhone XS Max has a sleek and smooth surface. The exterior of the phone is also good. It is just 7.7mm thick in terms of thickness. The iPhone XS Max slightly heavier when compared to other iPhones. It comes with an all-glass and stainless steel design highlighting an edge-to-edge OLED display. The design looks copied from the pricey, iPhone X with a top notch set up. It has three buttons arrangement on the side of the device. The phone is available in a Gold shade variant which gives it a more attractive and stunning appearance. The buyers have also claimed that the gold shade is much better compared to the ordinary Rose Gold. The colour gives a special presentation to the phone in Apple’s flagship variants. It has got a steel frame surrounding the screen with perfection. The phone is developed with new glass surface which offers an excellent feeling. The phone doesn’t have any headphone jack which the company has ditched since iPhone 6S and iPhone SE introduction. The Lightning port is now placed at the centre along with the speaker and microphone on the bottom of the iPhone XS Max. Apple has increased the protection of the phone with IP68 which makes the device water and dustproof. It can survive underwater for up to 30 minutes. iPhone XS Max features a bigger 6.5-inches super AMOLED capacitive touchscreen display with a resolution of 1242 x 2688 pixels. It gets an aspect ratio of 19.5:9 (458 ppi density). It features the latest edge-to-edge technology. The auto-brightness levels are quite effective and the Super Retina display is a great experience. Overall, the bigger display is great and offers amazing energetic colours and clear picture quality. By introducing the AI-powered cameras, Google has raised the level. Although, by adopting the Neural Engine technology in the iPhone XS Max, Apple also depends on the AI to make an amazing camera experience. The camera quality is somewhat similar to the iPhone X. It is integrated with dual 12MP sensors rear primary camera highlighting one wide-angle lens with f/1.8 aperture and the other telephoto lens with f/2.4 aperture. However, it gets larger micron pixels. The XS Max gets an all-new technology which the company calls Smart HDR. It can shoot various underexposed and overexposed pictures and later transforms it into a single photo. It also enhances the picture quality and makes your still pictures more clear and good. The Camera also features Portrait Mode as one of the most impressive elements integrated into iPhone X. It comes with a 7 MP front camera with an aperture of f/2.2. You can shoot stereo recording in a video in which you will be glad to know that XS Max also supports wireless charging, thanks to the rear glass exterior. You can use your previous iPhone’s charging device to charge your phone in less than an hour. It doesn’t feature Touch ID, but it comes with Face ID as the only biometric option available. Along with wireless charging, it also packs a non-removable Li-Ion 3174 mAh battery highlighting fast battery charging feature. The battery charges in just one hour when there is no charge. Moreover, it features Qi wireless charging and Siri natural language commands and dictation as well. So, this was the full review and features of the iPhone XS Max. It is for sure that you loved the latest features of this new iPhone. The company is still working to enhance the experience of its users by producing the latest updates. I hope you like this article and have a great experience with your purchase. You can also share this article with your friends and families who are extreme iPhone enthusiasts. You can read our previous articles if you want another option of best smartphones.